Revered white anti-racist southern activist Anne Braden died at the age of 81 on Monday morning, March 6, 2006 at Jewish Hospital in Louisville, ending nearly 60 years of unyielding action against segregation, racism, and white supremacy. Braden was hospitalized on Saturday, March 4, and had been treated for pneumonia and dehydration. Anne Braden’s memoir of the case, The Wall Between, was published in 1958, becoming one of the few accounts of its era to probe the psychology of white southern racism from within. Their case also introduced the Bradens to the civil rights movement blossoming farther south, in which white allies were few and far between. The Rev. Martin Luther King, Jr., meeting Anne Braden in 1957, pronounced her “the most amazing white woman” in her unswerving dedication to civil rights. The Bradens soon joined the staff of a regional civil rights organization, the Southern Conference Educational Fund (SCEF), and began traveling the region to solicit greater white support for the movement. As the 1960s dawned, Anne Braden became a mentor and role model to younger southern students who joined the movement, a role she maintained for the rest of her life. 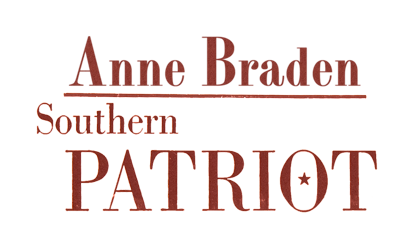 Although she was suspect in some circles, Braden publicized and supported the student sit-ins in the pages of SCEF’s Southern Patriot newspaper, which she edited, and she encouraged a broader vision of social change that would include peace and economic justice. She was also instrumental in Louisville’s Open Housing movement in the later 1960s, and among the leading white voices who helped to bring peace to the turbulent second generation of school desegregation, in which busing brought open violence to Louisville and other cities in the mid-1970s. After Carl Braden’s untimely death in 1975, Anne Braden remained a central proponent of racial justice in Louisville and across the South, eventually evolving from pariah to heroine. Braden’s primary message was the centrality of racism in the U.S. social fabric, but she constantly stressed that civil rights activism was as much whites’ responsibility as it was that of people of color. “Hers has been among the most forceful and persistent of white voices for racial equality in modern U.S. history,” according to her biographer, Catherine Fosl, author of Subversive Southerner: Anne Braden and the Struggle for Racial Justice in the Cold War South (2002). Decades later, Braden was still working against racism and for justice and peace. In the fall of 2005, she joined other Louisville activists on buses bound for the anti-Iraq War demonstration in Washington D.C. even though she went in a wheelchair. She was a frequent voice in the Rainbow Coalition nationally and a co-founder of the Kentucky Alliance Against Racist and Political Repression, as well as being active in local issues including police brutality, housing-not-bombs, environmental racism, civil liberties, and lesbian-gay-bisexual-transgender and other human rights. In the 1990s, she became the recipient of many awards, including the first ever Roger Baldwin Medal of Liberty, bestowed on her by the American Civil Liberties Union in 1991. She also became a teacher, offering social justice history courses at the University of Louisville and Northern Kentucky University. Braden was still teaching at the time of her death and was still fired by the passion for justice that had guided her adult life. She had completed a proposal for a local activist summer camp only the day before her hospitalization.